In general, moths have lagged behind butterflies in popularity. This is partly because most butterflies are active during the day, whereas moths are usually more active at night. This means that most people encounter butterflies more often than moths. Also, many moths are not as colorful as butterflies and so people don't like them as much. However, there are many colorful and/or interesting moths, such as the hummingbird moth (Macroglossum stellatarum) for example. I remember the first time I ever saw a hummingbird moth. It was hovering over the flower of a butterfly bush (Buddleia davidii). At first I wasn't even sure that it was an insect, but upon closer inspection I realized that what I was seeing was a hummingbird moth and not a hummingbird. What is unusual about the hummingbird moth is that it looks more like a tiny hummingbird than a moth. Also, whereas most moths feed at night, hummingbird moths are active during the daytime. It feeds on the nectar of many flowers and the butterfly bush is one of its favorites. Hummingbird moths are found thoughout North America and in most of Europe. Hummingbird moths belong to the family Sphingidae, which includes the hawk moths. In fact, Macroglossum stellatarum is often referred to as the hummingbird hawk moth. One reason this moth looks so much like a hummingbird is because of its long proboscis through which it feeds. It extends its proboscis out to the flower as it feeds, while hovering its body in the air. The following You Tube video shows a closeup of a hummingbird moth drinking flower nectar. Hummingbird moths not only have interesting feeding behavior, but they are also smart too. Once the hummingbird moth finds a flower source it likes, it returns to it to feed at approximately the same time each day. 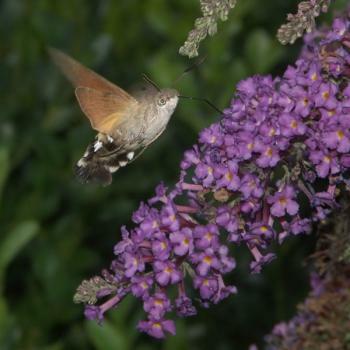 If you find a hummingbird hawkmoth in your yard or garden, check the following day and you'll find the moth back feeding at the same flower or flower bed. The host plant for the hummingbird moth caterpillar is from the plant genus Galium, commonly called bedstraw. 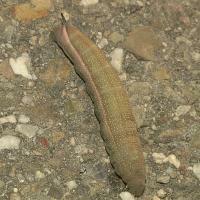 Hummingbird moth caterpillars are either green or brown and usually have a horn at their tail end. The pupa is usually brown. The hummingbird moth is not an endangered or threatened species. Image of pupa ©A. M. Liosi from Wikimedia Commons. All four hummingbird moth images licensed under the GNU Free Documentation license.